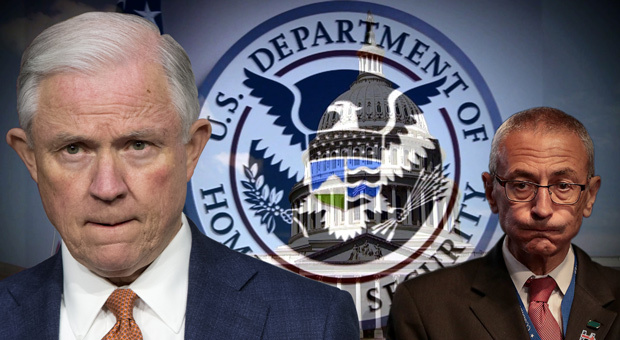 DHS Insider Blows PedoGate Wide Open! Arrests Coming—Only A Matter Of Time! What you are about to read is the extremely hidden back story of Pizzagate. Truly, nothing of exceptional gravity and great import ever gets disseminated in the public domain except by purposeful design. That design, of course, can be of either divine or demonic origin, or both. * In both cases, there are always very good reasons for the extensive dissemination. *Key Point: While the satanic powers within Deep State may have blown Pizzagate wide open for purposes of exerting even more power over their minions, perhaps the Highest Power is using the unprecedented revelations to save the child victims, as well as to shut down the global control mechanism (i.e. Pedogate) altogether. Yes, there are now many instances when raw truth about very serious matters is being downloaded on the Internet, but even that information is put into the hands by those who are really in the know. And, because those ultimate controllers of information (also known as the Hidden Hand) want it disclosed at a particular time. One type of truth which cannot be censored anymore is direct personal experience or secondhand accounts of events which are of a quite revelatory nature. However, even these are usually limited to a very narrow body of disclosures. Especially when the information and/or data is so highly classified and radioactive, there is virtually always the Hidden Hand which has intentionally pushed the button of disclosure. Or, pulled the lever of exposure. With this understanding of how the world works in 2017, it ought to be crystal clear that the divulgement of Pizzagate just before the exceedingly contentious 2016 presidential election was deliberate. Very deliberate! How so? As soon as the Democrats became aware that the election was going to be lost to Donald Trump, they panicked—BIG TIME! Recall that Hillary Clinton abruptly cancelled the big fireworks celebration planned for her victory party. At a level far higher than Hillary’s Campaign Chairman John Podesta, a major decision was made. That HUGE decision was directly related to the long-established contingency plan which was made deep in the bowels of Deep State. This highly secret plan was formulated specifically for implementation should Clinton lose the election. The name of that contingency plan is now well known as the Purple Revolution. Key Point: Please look closely at the following telling photo which captures the launching of the Purple Revolution. Both Bill Clinton and Tim Kaine are pensive in thought about their roles, whereas Hillary Clinton appears outright defiant. 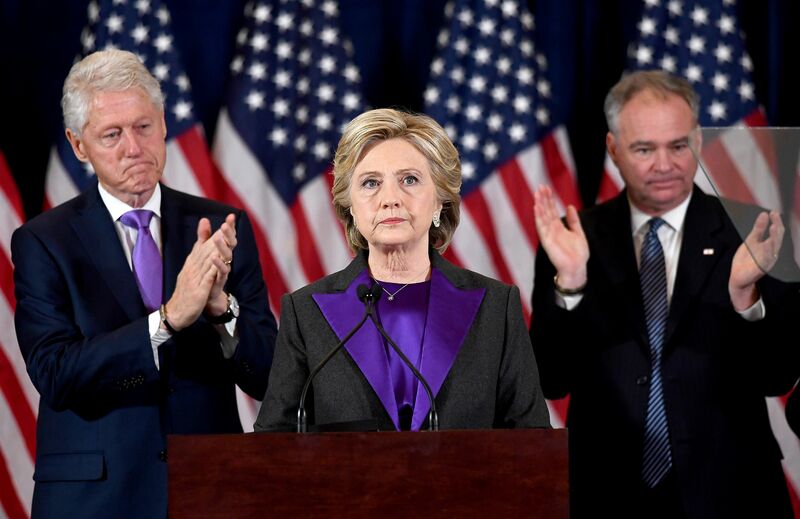 Of course, the attire speaks volumes as even Kaine’s wife (not shown) was dressed in purple. Exactly what does the Purple Revolution have to do with Pizzagate? In fact, Pizzagate has everything to do with the Purple Revolution. It’s not every day that a full-blown revolution is carried out on American soil. The last one took place over 240 years ago and was a pretty big affair. It was also difficult to get many of the Minutemen to show up in force and on time for the First American Revolution. After all, the ill-equipped, underfed, inadequately uniformed colonists were quite busy farming land for food and running their vital businesses. Fast forward to 2017! And to the inauguration of President Donald J. Trump. The continuing Great Recession that began in 2008 has likewise put extraordinary pressures on everyone–the rich, the poor and the middle class alike. Because of this reality, Deep State had to do something quite extraordinary; otherwise, how would TPTB sufficiently man their Purple Revolution. This is precisely why they blew open Pizzagate just before the election. An unknown majority of top leaders — at every level — within the Democratic Party, as well as the Republican Party, have all been severely compromised via Pizzagate or by way of the much larger Pedogate. As a matter of fact, the now notorious Podesta brothers — super-lobbyists Tony and John — are quite representative of the exceedingly depraved culture which predominates inside the Beltway, as it does in other power centers around the USA and the world-at-large. All it really takes is one criminal incident involving child sexual abuse for a politician to be ruined for life. This potential ruination hangs over his or her head for the remainder of their political career like Damocles sword. Consequently, these government and corporate leaders can be perfectly controlled to do whatever Deep State demands. Multiply the coercion dynamic of blackmail and bribery, threats and intimidation, which inevitably result from Pizzagate involvement, times countless politicians and government officials, lawyers and lobbyists, judges and prosecutors, and you have a national (and global) network of ironclad control like none other in modern history. Whatever Deep State wants done, is done … at the appointed time, at the prescribed place and in the ‘right’ way according to established Deep State protocols. One of the dead giveaways of this CIA-directed black operation, which also doubles as a massive ongoing psyop against the establishment, is the calculated timing just before Clinton’s loss. Many armchair analysts have suggested that her loss was due to Pizzagate. Not so, the ruling elites already knew that Hillary had lost the critical swing states well before November 8th of 2016. They also knew that in order to outright steal the election from Trump, they would have to conduct so much vote fraud and election theft that it would be impossible to conceal. Especially after conducting so many obviously fake polls and committing so many voter registration crimes, did they make a final decision to allow a Trump victory, and to execute their Plan B. Who could disagree with the fact that there was, and is, no more effective way to get EVERYONE on board with waging a Purple Revolution than with the threat of exposure that comes with Pizzagate? Just look at those high government officials and elected representatives who are incredibly transparent about fighting a war with the Trump Administration. Hillary and Bill Clinton. Barack and Michelle Obama. Joe Biden and Tim Kaine. Chuck Schumer and Nancy Pelosi. Maxine Waters and Elizabeth Warren. John McCain and Lindsey Graham. Paul Ryan and Mitch McConnell. Just how compromised these purple revolutionaries are with regard to Pizzagate criminality remains to be seen in court. Nonetheless, the most damning evidence is being fastidiously accumulated for the trials and sentencing to begin. Which also means that the hot phase of the Purple Revolution (PR) has been accelerated considerably. That means the great likelihood of an American Spring, sooner than later. Will an American Spring take place in 2017? If so, the Trump Movement needs to lead the way. *The following “Special Report” clearly delineates the difference between Pizzagate and Pedogate for those who are uninitiated in this area of research. Because the Democratic side has conscripted so many, so easily to the cause of fighting the PR, and because the liberals, lefties and progressives have so much to lose, the Deep State has undoubtedly moved their plans of insurrection up on their calendar. The entire DNC leadership is now facing existential threats, not merely the politics of personal destruction. When the truth comes out about their respective involvement in either Pizzagate or Pedogate, the whole world will reel in horror. These heinous crimes against the children of the United States and other nations will be too serious to ever forgive. Nor will they ever be forgotten by the present planetary civilization. The sooner that President Trump closes this sordid and shameful chapter of American history, the quicker that other countries can begin protecting their children as well. President Vladimir Putin has already terminated the adoption of Russian children by Americans for this very reason, among other related issues. The time is now to shut down Pizzagate in the USA, as well as expose Pedogate globally, so that Deep State finds itself in deep trouble. Only in this way can the seditious Purple Revolution be forever shut down.